(Ottawa, Ont.) Wheelchair Basketball Canada is pleased to announce that the Burlington Vipers, in conjunction with the City of Burlington, will host the 2014 Canadian Wheelchair Basketball League (CWBL) National Championship April 4-6, 2014 at the Haber Recreation Centre in Burlington, Ont. “The CWBL National Championship is a prestigious event and we’re thrilled to see it come to the City of Burlington for the first time in history,” said Wheelchair Basketball Canada Executive Director Wendy Gittens. The tournament features competitive club teams from across Canada as they compete for the title of national champion and includes past, present, and future athletes with the Canadian National Team program. Spectators will have the opportunity to witness all of the skill and athleticism that make wheelchair basketball one of the most popular sports for athletes with a disability in the world. The CWBL National Championship is the premiere event on the annual domestic wheelchair basketball calendar in Canada. The tournament also plays host to the Wheelchair Basketball Canada annual awards banquet. 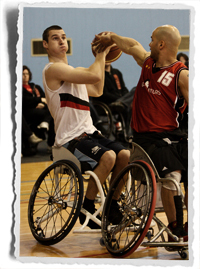 The Canadian Wheelchair Basketball League (CWBL) was founded in 1986 and has two primary divisions: the open division and the women’s division. The league features wheelchair basketball club teams from across Canada and culminates each season with a national championship for each division.